a nerve from the inferior ganglion of the glossopharyngeal nerve, passing through the tympanic canaliculus to the tympanic cavity, forming there the tympanic plexus that supplies the mucous membrane of the tympanic cavity, mastoid cells, and auditory tube; presynaptic parasympathetic fibers also pass through the tympanic nerve via the lesser superficial petrosal nerve to the otic ganglion, where they synapse with postsynaptic fibers that continue to supply the parotid gland. a branch of the glossopharyngeal nerve that participates in the formation of the tympanic plexus and provides sensory innervation within the middle ear to the mucosa of the cavity, pharyngotympanic tube, and mastoid air cells. 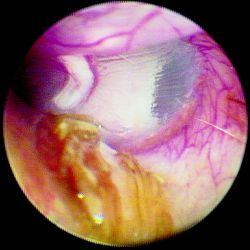 It also contributes general visceral efferent fibers, which leave the tympanic plexus in the lesser petrosal nerve. Origin, from the inferior ganglion of the glossopharyngeal nerve, passing through the tympanic canaliculus to the tympanic cavity, forming there the tympanic plexus that supplies the mucous membrane of the tympanic cavity, mastoid cells, and auditory tube; presynaptic parasympathetic fibers also pass through the tympanic nerve through the lesser superficial petrosal nerve to the otic ganglion, where they synapse with postsynaptic fibers that continue to supply the parotid gland. Synonym(s): nervus tympanicus [TA] , Andersch nerve. Carolus Samuel, German anatomist, 1732-1777.